It’s called “the singular narrative.” It’s what the masses demand. It’s a narrative principle that goes back at least 4,000 years — to the story of Gilgamesh — as Hollywood screenwriters know. This morning we finally see behind the scenes of an epic tragedy. Just as I began saying in January on this blog, Hillary Clinton has lacked a clear singular narrative/theme/slogan/message from the start. This spring I communicated all this for three months with a Hillary campaign staffer who tried to pitch my thoughts to the campaign but hit a brick wall. The tragedy is that from the start Hillary had a clear singular narrative and one word theme of EQUALITY. It was there in the opening 250 words of her candidacy announcement on June 13, 2015 as she talked about “No ceilings” and said it VERBATIM with “what it takes to build a strong and prosperous America: “Equality of opportunity…” But she eventually stumbled upon the shallow slogan of “Stronger Together” which says nothing about equality. She could have used this singular equality narrative in the spring to join forces with Bernie Sanders who had the same theme at the core of his campaign. They could have united under a single historically powerful word. But the hacked emails now show the truth of what happened — utter narrative chaos. She ended up with only one direction to go — attack Trump’s stronger singular narrative. 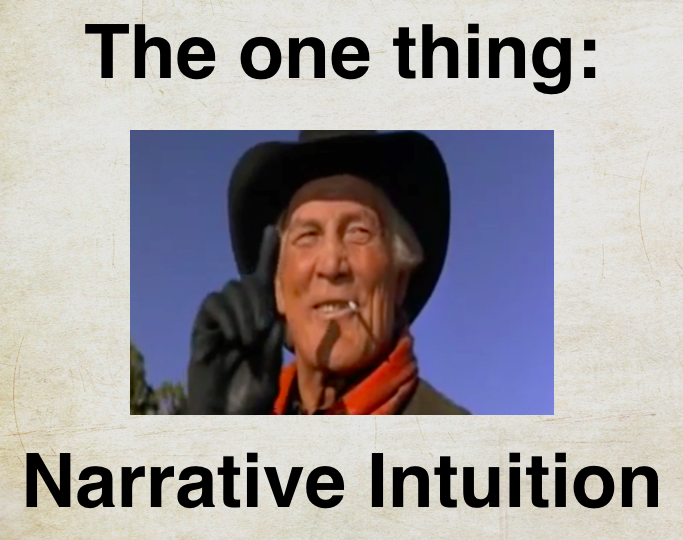 THE ONE THING (THAT THE CAMPAIGN HAS LACKED): These days I open my talks with a 30 second clip from the 1990’s movie, “City Slickers” that has come to be called “The Curly Moment.” Jack Palance as the cowboy-wise Curly tells Billy Crystal he needs only one thing in life. Billy Crystal asks what that one thing is. Curly replies “You gotta figure that out for yourself.” As the hacked emails of Hillary’s Campaign Director John Podesta now show, her campaign never did figure that out. In August of last year I heard NY Times columnist and three times Pulitzer Prize winner Thomas Friedman talk on “Meet the Press” about how Hillary Clinton’s campaign lacks a message. I sent him an email agreeing with everything he said, he wrote back a nice, albeit sad, reply of basically “yep.” By the fall, as my book, “Houston, We Have A Narrative,” was coming out from University of Chicago Press and I was living and breathing narrative principles as I became inescapably aware that her campaign was suffering from complete narrative chaos. Last month The Guardian ran an editorial with the title of, “Hillary Needs A Slogan.” I forwarded it to Friedman, he wrote back, “Yep, thanks for reminding me.” It’s been a very sad thing to watch. At the same time, Donald Trump showed deep narrative intuition from the very start by launching his campaign with a single, narratively powerful slogan, “Make America Great Again,” from which he has not veered one inch since that day. Less than a quarter of the way into his announcement speech he first mentioned it in reference to the existing system “… they will never make America great again.” Since then he has repeatedly circled back to that singular, narratively structured message endlessly, including two nights ago in the latest debate. In my book I present the ABT Narrative Template, which I have termed “the DNA of story.” It is the template of “and, but, therefore.” Trump knows this template at a deeply intuitive level. His slogan has been, “America is a great AND mighty nation, BUT we’ve slipped in the world, THEREFORE we need to make American great again.” This has been the DNA of his campaign from which, despite all his incompetence and ineptitude with gaffes and anger, he has not veered at all. It is probably the central element that keeps his disastrous campaign still alive and enabled him to score respectable marks in this last debate. That was how two NY Times writers put it this morning in their article about the hacked emails of Hillary’s campaign director John Podesta. These words are no surprise to me. In March I managed to contact James Carville with my thoughts about the absence of a clear narrative to her campaign. In an effort to be of assistance, I pointed to the narrative tools I present in my recent book. I do this stuff for a living these days. I’m not a crackpot — I currently work with five government agencies including NASA, National Park Service and USDA, and a variety of other science and environmental organizations as I have for over a decade. He very kindly referred me to Hillary’s campaign, a staffer contacted me in April, we spent three months with me offering up my specific analytical suggestions, and he valiantly trying to generate some interest. Ultimately, as the hacked emails reflect, the cacophony of voices in her campaign made it hopeless for any outside voice — even if the person has authored three books on narrative. The hopelessness of my plight was spotted early on by one of my Hollywood buddies who pointed me to the episode of HBO’s “Veep” where the campaign speech writers have a big cork board covered with different Post-it notes representing the contributions of each of the competing speech writers. He warned that in a situation like that the chances of an outside voice being heard were zero. The hacked emails now confirm those comic scenes are a direct representation of what really has gone on. How could her campaign committee have been so totally tone deaf to the need for the singular narrative? “No Ceilings” could have been the war cry for millions of people across the land. There’s a month left. She’s gaining momentum. Just start shouting it out — EQUALITY! NO CEILINGS! Something, anything that has clear, singular narrative dynamics (Stronger Together doesn’t). It’s there in the Declaration of Independence — “all men are created equal” — that’s the slogan, with of course the one minor gender updating needed now. Shout it out and bring this train into the station.